this Cisco brochure from the China Information Infrastucture Expo 2002, Dec. 3-6, 2002. The first two pages of the brochure show a Cisco exhibition booth full of products clearly aimed for use by police and other public security forces. It is pictured here (and blows up to full size when you click on it, WARNING: IT'S A VERY BIG FILE) - both in the original Chinese and in English translation. 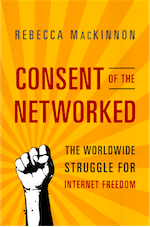 In his book Gutmann describes a conversation with a Cisco salesman whose sales pitch included how Cisco's products help police conduct internet surveillance: "the Cisco salesman confirmed that the Chinese police could even remotely check if the suspect had built or contributed to a website in the last three months, access the suspect’s surfing history, and read his email." In a recent speech Gutmann explains why this matters. The real problem is that the next Tiananmen - in whatever incarnation - is much more likely to fail if Chinese citizens have to fight not only the PLA, but Cisco and Motorola, Microsoft and Intel. And this time, Americans will bear a special responsibility for that failure. And I predict that the excuses that we hear from Cisco and Microsoft today (“Microsoft abides by the laws and regulations of each country in which it operates…" - as if the Chinese constitution forbid the word “democracy”) will be remembered as a shameful moment in U.S. corporate history. So it’s up to us, activists, journalists, watchdogs, Congress, anyone who’s involved with China, to put pressure on American corporations; shareholder proposals; divestment from university contracts. Make a copy of this brochure and send letters, faxes, emails demanding an explanation. Tell them if the Chinese Communist Party wants to use our technology, it must pay the democracy tax. I have some questions for Chinese and China-based bloggers out there... assuming that a number of you are still reading this through proxy servers. Please forgive my rusty Chinese... I'm much better at reading than writing, I'm afraid. I'd love to know your views. If you want to answer this on your own blog, please post the link in the comments section here if the trackback doesn't show up automatically. I would especially love to know what the Chinese bloggers think about this question. 麻烦blogger们在自己的 blog 上,或者在下面的“comments” 里面发表自己的意见! UPDATE: Anil has clarified in the comments section of this post that some typepad.com blogs appear to be accessible in some places, while all blogs.com ones seem to be blocked. This is a more explicit response than the official Typepad blogpost, which doesn't actually name the Chinese government or recommend specific proxy services. Wozy writes that since Typepad is a fee-paying service, and since his main readership can no longer access his blog, he had no choice but to move his blog. He describes how he decided after much comparison-shopping to go with the free hosting service weblogs.us. He also points his readers to the RSS and feedburner feeds of his blogs, which (for now anyway) circumvent the Chinese censors. UPDATE (6/29, 3pm EDT): CNblog reports Weblogs.us is now blocked too. I have yet to decide whether and when I'll move this blog to a new host. I have good friends who invest in or work for Typepad's Six Apart. As a non-technical person, I love the service's features and user-friendliness. So I feel really torn. Meanwhile, people in China who can't or don't want to use proxy servers can subscribe to the content through their RSS readers (XML feed here) [CORRECTION: rss and Atom feeds are also blocked if not run through a 3rd party service], or click here to read it through Feedburner. Stay tuned for more on Cisco. Blogsome, the free Wordpress blog hosting service based in Ireland, is now blocked in China, according to Chinese blogger Maomy, writing on the Chinese group blog, CNBlog. Maomy - who himself blogs on Blogsome - says the free open source service has become increasingly popular among Chinese bloggers, but that he hadn't expected it would be blocked so quickly. Despite the wishful thinking of some, he doesn't believe Blogsome's inaccessibility is likely to be an innocent "technical problem." Other Chinese bloggers I've been communicating with tend to believe this is all part of a tightening-up in the run-up to the June 30th deadline for website registration. 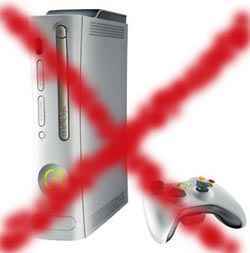 On June 16th, GamePolitics.com called for gamers to boycott the upcoming Xbox 360 in protest of Microsoft's decision to support government repression of Internet users in the Republic of China. A polling feature recently added to the site indicates that readers are indeed heeding the call. As of 7:00 P.M. Sunday, over half of poll respondents indicated that they would either boycott the Xbox 360 or hadn't made up their minds yet. GamePolitics Editor Dennis McCauley was both surprised and encouraged by the results of the polling. "The poll shows that gamers are able to put games into their proper context with the world at large. Gamers these days are not only tech-savvy, but also politically aware. The fact that more than half might be willing to forego a hot new system like the Xbox 360 simply to make a political statement just blows me away." The boycott can be discussed on their blog here. It's only fair to mention that the numbers have changed somewhat. The poll remains open, and as of Tuesday afternoon it looks like this: Will Boycott Xbox 360 - 26% Won't Boycott - 66% Not Sure - 7% That's with over 400 votes recorded. If the results finish this way, it will still mean that 1/3 of respondents plan to either boycott the Xbox 360 or will consider it, based on MS' stance in China. That's encouraging, as gamers are not normally given credit for political awareness. Several people in different parts of China are now reporting that blogs hosted as http://"blogname".typepad.com are now accessible from China, although blogs at http://"blogname".blogs.com (also part of the Typepad service) are still blocked. So unfortunately, this blog remains inaccessible without use of a proxy server in China. Congratulations to everybody on the first annual Always On/Technorati Open Media 100 list: "the power list of bloggers, social networkers, tool smiths, and investors leading the Open Media Revolution." Lots of good friends and cyber-mentors on there... and naturally, a bunch of past and present Berkman Center fellows. In my over-committed multi-tasking fog, I didn't realize until just now that there is also a 50-person honorable mention list, and somehow I wound up on it. Thanks so much to the people out there who nominated me. I'm in some pretty amazing company. David Sifry explains the nomination process. Not surprisingly, there has been a fair amount of controversy in the blogosphere surrounding this list, as Stowe Boyd explains. Lots of people question the point of the list and the process through which it was compiled. All blog discussion about it can be found via Technorati here and here. In the comments and trackback on my last post, a number of people keep concluding that I am calling for a boycott of China or a boycott of Cisco or a boycott of U.S. companies investing in China. I said no such things - not anywhere in that post nor anywhere on this blog. 1. I am not calling for a boycott of China or of Cisco or any other companies. I am calling for closer scrutiny of exactly what is being sold directly to whom, and to what extent U.S. companies knowingly sell technologies to Chinese state-controlled entities who are obviously going to use the equipment or software for censorship and surveillance purposes. I want to know if these companies are providing service or customization which would make it clear that they know exactly how those technologies are going to be used - despite public claims of innocence and clean hands. I agree, China is better off - and the future of democracy in China is better off - thanks to the existence of Cisco routers in China. But to me, there is an important difference between selling routers to China and providing software services to China in general - with the understanding that one can't control how the technology ultimately gets used - and the sale of technology directly to Chinese government entities whose intentions are rather obvious. Way back in 2001, according to this report here by the International Centre for Human Rights and Democratic Development, Cisco was courting the Chinese Public Security bureau for business. Author Ethan Gutmann has reported similar things. As have Amnesty International and the Open Net Initiative. Cisco denies any direct involvement or knowledge in how its products were going to be used. Nobody can 100% confirm anything. But are we just going to take Cisco's word for it and leave it at that? Seems like the MSM is, and so are our government leaders, but I'm frankly not convinced. I do not believe the questions should be dropped simply because lots of people find these questions really annoying and inconvenient - or because the answers are likely to fall into murky grey areas that can't easily be defined as "good" or "evil." 2. I am in favor of free trade, I support capitalism, and I think trading with China is a good thing. Believe me, anybody who knows me at all well can tell you I'm neither a socialist nor a protectionist. After living in China for nine years straight I saw first-hand how jobs created by foreign trade and investment have vastly improved the lives of urban Chinese, helped create a nascent middle class, and helped millions of Chinese gain much greater control over their lives because they're no longer economically dependent on the government. I don't advocate boycotting made-in-China goods just because they're made in China. However if I learn that a particular company is sourcing goods from Chinese prison labor, or from factories where workers rights are clearly abused, I'll definitely avoid buying their products. Likewise, I consider the deliberate sale of technology goods and services to the Chinese Public Security Bureau to be an unacceptable business practice, and we should ask our corporations to stop doing business with documented human rights abusers. 3. I don't think legislation or political lobbying is completely useless. We have a Foreign Corrupt Practices Act. It's not perfect, a lot of people violate it, but it keeps U.S. companies from engaging in the kind of blatant wholesale bribery that helps prop up nasty regimes. It is a statement of our values as Americans. It is much better that it exists than that it doesn't. We have an Arms Export Control act too. We have a long-held and established tradition as Americans that certain types of commerce are not in our national interest and are contrary to American values. Suppression of free speech is contrary to our values. The Global Internet Freedom Act, which has been introduced in committee but still un-passed by Congress, states that these are indeed our values. But it fails to set out basic standards for how our corporations ought to help protect these values. I think it should. Why does this matter? Our President says that America stands for freedom and democracy, and that we are prepared to sacrifice the lives of our men and women to uphold these values around the globe. Yet at the same time, our corporations aren't asked to forego a penny of potential profit for the sake of these values. They dishonor our men and women in uniform and our hard-working diplomats trying to represent us under difficult and often dangerous circumstances. No wonder so many people around the world think Americans are hypocrites.